1. Thank you for joining us tonight. We agreed to partner with Seattle Arts & Lectures on this series for a very specific reason: our Master of Communication in Digital Media program is both blessed and cursed by its subject matter. I have no doubt that technology and communications has hit “zeitgeist” levels — it’s all pervasive, and we talk about it a lot — from our cellphones, to Facebook, to Wikileaks to uprisings halfway around the world. Which helps put us at the center of this conversation. But it also needs we need to keep up — which is exhausting. We also owe it to our community — our alumni, our partners, to update them as well. That’s the purpose of this series: to give you the latest snapshot of what we think matters most now in communication and technology. We’ll kick it off tonight with my overview, followed on February 23rd, by my colleague and Department Chair, David Domke on generational changes influence what’s going on. Obviously, the law is trying to keep up as much as we are, and MCDM law professor Kraig Baker will give us the latest on risks and social media on March 9th. On March 23rd, MCDM Associate Director Scott Macklin will build upon my notion of story tonight and explain how communities are at the heart of that crucial activity, based on his own groundbreaking filmwork. And Anita Verna Crofts, who’s also an MCDM Associate Director, will conclude the series on April 6th bya going global and looking at digital media, metrics and emerging markets — where some of the most developments are occurring in our field. 2. I’ve led the Master of Communication in Digital Media since 2007. It took me a while to figure out why I was a good choice for the position, given that I had never really aspired to academia. But I realized quickly what value I did bring — it was that I embodied this very disruptive transformation from traditional, “legacy” media to a less institutionalized “digital” media. 4. Despite my use of technology (and my lack of facial hair), network news was very much the old world of communication dominated by a few large, well-resourced institutions. As was communication generally. 5. Back then it was definitely a separation of church and state. Far away from my world of journalism was marketing, focused on creating a message, targeting a market, with a goal to sell something. 6. In my journalism corner, we had a hallowed mission of investigation and then reporting what we saw as the truth. 7. Despite their separation, marketing and journalism had something in common. Both were endeavors that involved the filtering of information, polishing that information to a sheen, and then publishing it when it was ready. 8. It was a relatively sturdy process, predicated on the fact that with the 20th century “industrialized” information model — with high barriers to entry due to the expensive nature of communication (satellites, printing presses), there were relatively few ways to reach the general public. So we devoted a high level of trust and attention to these large institutions. 9. But now, a decade into the 21st century, that equation has been turned on its head. With the explosion in readily available, cheap digital technology thanks to the internet, cameras, etc. almost everyone is a publisher. We have more information available to us than ever in the history of our species. Which has taxed our attention span, and called into question whom we can trust with such a multiplicity of information sources. Filter then publish, has become publish, then filter because of these plummeting costs. 10. Even in the last 12 months, two awards embody this incredible transformation in traditional media. The Advertising Age Marketer of the Year, and The George Polk Award for excellence in journalism. 12. The Polk Award, for the first time went to the then anonymous amateur creator of this video, shot with a basic cellphone camera, seen around the world on BBC, CNN and YouTube. 14. Over in the marketing corner, Ford Motor company won the Ad Age award for its groundbreaking Ford Fiesta campaign. Determined to convince a younger demographic that it wasn’t just the F150 company, they decided to recruit 100 online influencers to test drive their new Ford Fiesta car for 6 months, and report back to their constituents through their social networks. 16. What the Neda Iran video and Ford had in common was a strong sense of story, as well as a way to connect to a larger community through technology and social media. 17. And both were exemplified by a lack of institutional control — whether its a repressive regime or a Fortune 500 that was accustomed to controlling every one of its messages. As well as an authenticity to the narrative that didn’t imply control over “message.” The exact opposite really, which is what made it so compelling to so many people. Ford took a huge risk, they were giving out cars that came from their European factories still, which meant that they were stick shift, and only one of their Fiesta Agents knew how to drive stick. Rather than kill what was certainly a public relations disaster in the making, they decided to think entrepreneurially and train all their agents over a long weekend at a race track in California. And that did the trick. 19. No, now, there’s a second question. Attention is NOT enough. We need a second component — engagement that leads to transaction. Whether it’s a sale, a vote, or just a change in your thinking. For example, we invite organizations to work with our students as “clients” in our classes. The Woodland Park Zoo was one such client. They’re looking to be seen not as a zoo (despite their name) but as a conservation organization. So as students developed communication strategies, the question always was, now that you’ve come up with a narrative around communication the conservation nature of the organization, HOW DO YOU KNOW that you’ve switched that lightbulb on in people’s heads? Have you engaged them in this new narrative? 20. This takes us a long distance away from “message” and “audience” two words that I try to ban from my classrooms. I truly can’t stand “Messaging” because it implies that NO ONE IS LISTENING. And in the social media world, we need to be well aware that this is now a two-way street. The Iranian government — or the Egyptian one — can sell its message all it wants to its people, but if they don’t agree, they now have ways to talk back, and even worse, talk to each other. 22. “community” or “participants” rather than audience. Or at least let’s try. 23. And let’s also identify that a key objective in building these new relationships through communication hinges on TRUST. Especially when we don’t know who exactly we can trust — whether they’re formally rock-solid news organizations like the New York Times, or a guy who we just started following on Twitter who reported that a US Air plane just landed on the Hudson River in New York City. 24. How does storytelling help us overcome our two challenges of attention and engagement? First a structured, compelling narrative of beginning, middle and end draws people’s attention. 25. And an ongoing strategy of engagement around that narrative convinces them to transact with us. 26. How do we know this? Well first, that what’s noted child psychologist Daniel Siegel says. I saw this happen in the storytelling class that I’m teaching this quarter when I asked students as their first exercise, to tell a story about themselves, orally, that had a clear, beginning, middle and end. These stories were funny, poignant, intensely personal, and sometimes deeply emotional. By the end of the exercise, it was clear that this gathering of strangers had bonded in ways that would not have been possible in a traditional classroom. 27. I also know it from a film that I produced five years ago called Independent America. Here’s the trailer…..YOUTUBE….we had left our jobs at NBC, we no longer had the trusted credibility of big media reporters. So why would anyone talk to us? And why would anyone want to watch our film? So we overcame that challenge by first creating a truly compelling, relatable road trip narrative. Then we decided to share the film even as we were shooting it with the members of like-minded organizations — and this was before YouTube was launched. The result? The people formerly known as the audience contributed to the film by suggesting great stories — which ended up being the best half of the film. And they asked us to put it on DVD even before we got home, so that they could show it to their communities. Ultimately, this homemade film was shown around the world on TV, in first class cabins in Australia, and is now on Hulu and iTunes. 28. The idea of a compelling narrative comes straight from Aristotle. Thousands of years ago, he wrote Poetics that looked at what made for a compelling drama. And he identified the universal notion of beginning, middle and end. Pretty obvious stuff right? But here’s what you need to remember. The crucial part of the story happens between the Climax and the end. When you, the storyteller, have tied that knot of tension so tight, and then you let them off the hook, by giving them some kind of cathartic “denoument” — literally the untying of the knot. So will Luke Skywalker listen to the force and blow up the Death Star, even with his father on his tail? He does. The Death Star explodes, and everyone gets a medal. In our film, will we make it across America by following our two road rules? Mostly. And we learn an important lesson. 29. Through this, we learn that “feelings” matter in communication, we need to engage that right brain more than ever to remember anything that happens in this chaotic information ecosystem. Indeed, famed mythologist Joseph Campbell would say that’s why we ultimately tell stories, and have this universal constructs of the “hero’s journey” — no matter what the culture. It’s what sticks, it what’s allows us to remember crucial information. 30. And anyone who studies story will tell you it’s what also helps us to build community. Are the world’s great religions built around a series of rules, or a series of stories that established those rules? Stories are how we connect as society. 31. Which leads us to the central construct of our Master of Communication in Digital Media program, and what I also believe to be the “liberation theology” of any professional who wants to engage in communication….entrepreneurially minded professionals and organizations can now serve as trusted conduits of information within specific communities. 32. 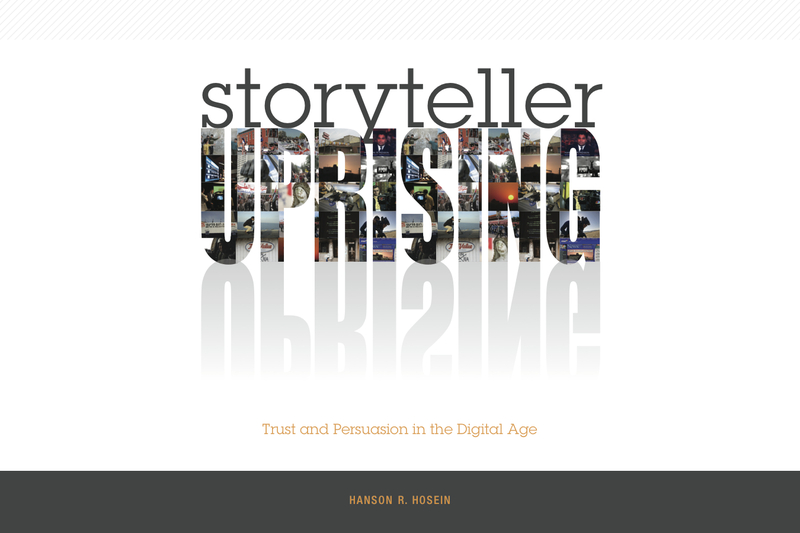 They — you, we — can build this sustained influence through the emotional connectivity and interactivity of storytelling. 33. So what about that “trust” element that I identified? In sociology, there’s the classic “Prisoner’s Dilemma” scenario. Where two burglars are arrested. The police put them in separate jail cells and give them the same offer; they can go free if they rat the other one out. 34. Assuming that neither burglar knows the other very well, and that they can’t communicate, the rational outcome is that they’ll rat the other out and both go to jail. 35. But what if they could interact repeatedly? Some researchers have concluded that if they can build trustworthy behavior through this interaction (i.e. not taking advantage of the other), they’re less like to rat the other out. So both prisoners refuse to talk, they both spend a night in jail, and they’re released. 36. That’s the Storyteller Uprising — when you realize that you’re not alone, that you can build trust with someone else through continued interaction, sharing a compelling narrative. Things happen, and we leave that passive, one-way non-interactive 20th century approach to communication to something far more disruptive. 37. Where we as individuals can build social capital amongst ourselves to do amazing things that might not have been possible otherwise. 38. That we can establish TRUST. 40. Now we’re seeing Twitter Revolution 2 in Egypt and Tunisia (or the “Arab Spring” as my colleague Phil Howard call it). Right? What do you think? Did social media cause the uprisings in Tunisia and Egypt? [DISCUSSION] Hitting “like” on a Facebook “Down with Mubarak” page is not going to convince him to step down, or fire his cabinet is he? It has to be coercive power, taking to the streets, challenging the affections of the army. 41. I would argue, that although those platforms may have enabled, or at least accelerated the uprising, that it all began with a story. With the self-immolation of a frustrated young man, Mohammed BOU-A-ZI-ZI, that finally convinced the populace that had suffered for so long that enough was enough. And that it was the story of that uprising, combined with the story of an Egyptian blogger who died in policy custody, that inspired Egyptians to take to the streets, as they could relate with their own stories of frustration, repression, victims of corruption. 42. And although social media may have enabled, let’s not forget about the role of traditional media — especially given the lack of computers and smartphones in that part of the world in relation to the plethora of satellite dishes that carry Al-Jazeera. That yes, TV still had a role to play. 43. So now, as we move further along into effective communication in the 21st century, we take all of this into account in our MCDM program as well as what is to come in this lecture series — we realize that we need to recast this formula — that if it’s truly about storytelling and engagement, that we need to figure out how that engagement occurs, and how deep it really is. It’s a tough, murky area still, but one that definitely bears study. How do we really know that we’ve engaged people? It’s easy in the Middle East — they take to the street. But what if it’s something as ephemeral as changing someone’s mind about an idea? Like climate change? 45. Take for example Ford’s latest digital media foray. Compare this to the Fiesta campaign. We discussed this in class. Points, prizes, etc. But what’s really at stake? It’s ultimately just a contest. And it feels very programmed. Not that authentic in the end. Nothing at stake. Warmed-over Amazing Race — doesn’t feel like compelling content. 46. Here’s what we do recognize. That it’s no longer the Wild West in digital media. We’re beginning to settle now, build towns. And we want to see results. I like to call it the Age of Return on Investment. 47. Especially with the economic downturn. The internet is a fact-of-life now, as is our use of it. 48. And we’re seeing growth in three areas: social networking, games, and video. Not in e-mail, barely in search. 49. It’s definitely the rise of Facebook, which has Google running scared, as we’re spending more time on FB, and finding more information through our friends than we are through a search engine. So Facebook, Twitter, YouTube are the holy trinity of social media…..
50. And this great viral ad from Old Spice. YOUTUBE OLD SPICE Still no longer enough to say, well our video had 6 million hits on YouTube. Did all that attention result in something other than a high view count? What was the transaction, the ROI? With Old Spice, it was a 110% increase in sales for what was once seen as a really bad Christmas gift for dads. 52. So let’s recap. We see the rise of action-inspiring, authentic narratives such as the Neda video. 53. And Ford’s Fiesta campaign. Amazingly, that company has folded its PR and Marketing divisions together, and is now devoting a third of its outreach spend to digital and social media. Which tells me that if a major corporation like Ford is making such changes, we are indeed getting into a far more analytical, metrics-focused world of communication. 54. And the past month also reminds me that as much as we want to get caught up in numbers, and in the growing dominance of YouTube, Facebook and Twitter, that what still matters most is excellent, inspiring content. As we’ve seen in Egypt. 55. Recognizing that every organization — every individual — now has the power to be its own media organization. Such as the White House cutting out the middle man and essentially creating a media channel for the State of the Union — interactive, interesting, immersive. 56. This is the uprising — a multiplicity of ways for us to reach others in ways that were formerly the exclusive preserve of institutional media. Now we all have access. 57. If you’d like to delve deeper into this, you can download my own Storyteller Uprising manifesto here, which will lead you to the free PDF version, or the Kindle edition for $2.99. Your choice! It’s an experiment. 58. I’d also like to make a plug for my TV show on UWTV, every Wednesday at 9 p.m.
60. You may have noticed the four words “Innovation,” “Entrepreneurship,” “Community” and “Entertainment” in the opening animation to the show. It’s part of our new regional initiative, “Four Peaks” as we attempt to serve as the connective tissue between the storytellers/content creators and those who are creating the technology. We host monthly salons, including one in this building on February 21st with Nathan Myhrvold (Are We Ready for the Future), with a signature event in October. Call it TED meets South by Southwest, meets Davos. It’s all part of our engagement strategy. 61. And if you want to watch this slide presentation again, you can do so now. 62. I’d like to thank you for your kind attention, and participation. I welcome your questions.